This was inspired by the grav-assisted APC in one of my old Traveller books (but for the life of me I cannot find it - I just remembered something like "imagine a tank moving at Lamborghini speeds...). 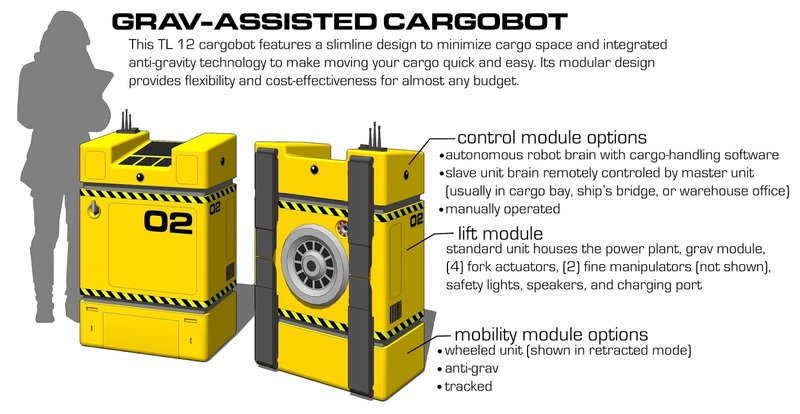 So the idea is the cargo bot has an anti-grav module to make the cargo lighter and therefore easier to move around. I provided several different options from what I remembered from Book 8 - Robots, but am past my days of gearheading all the small details and counting credits. I figure the these would run from about 80KCr for the manually driven cargo mover up to 200KCr for the grav version with all the bells and whistles. 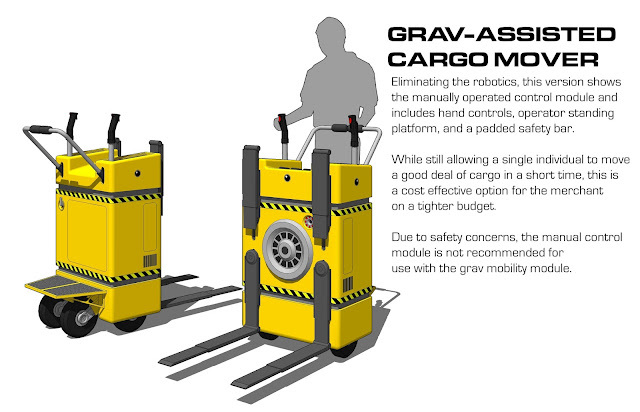 I created and really liked an image of a grav cargobot holding cargo from above, like some flying beast with prey in its claws, but then I started thinking about the anti-grav cargo module contradicting the effects of the anti-grav mobility unit. It made my head hurt. 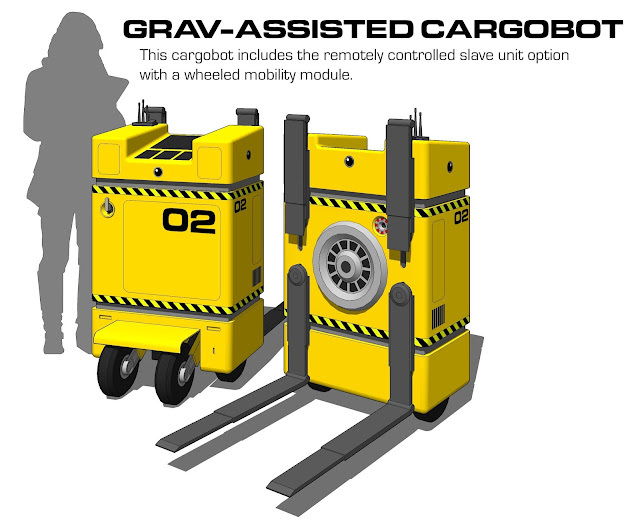 I eventually remembered this is all fiction and decided anti-grav fields could run the same way or perpendicular to each other, but not in opposite directions, hence the last image with the robot below the cargo. Finally, this is a strong attempt of mine to stay away from anthropomorphized robots. I like Star Wars as much as the next guy, but after Wall-E and BB-8, the cute robot thing is starting to get to me. This is my push back with the cargobots just being sophisticated equipment. No vocoder, although it does have an audible warning system. It communicates via text with the user through the ship's computer, the user's hand computer/datapad, or the screens on the center of the control unit. Nice, but what about inertia from moving around that stuff on the end of those arms? Modern forklifts are designed with a heavy counterweight below and behind the load. If the bot is moving the load quickly, it might just topple over, or slip. That certainly could be the case. I didn't do any calculations on kgs of thrust or anything. Variables such as the mass of the cargo, movement speed, and the gravity of the planet would come into play. My thought was that the grav module would reduce the mass of the cargo, but not eliminate it completely, kind of like moving a box of pillows instead of a box of bowling balls. Makes sense. I'm just following my science fiction rule of "if it's doing the job that's currently available for equipment, what are the problems that are currently solved." It can also be called "Engineer's Disease". Since we don't know the physics behind the anti-grav tech in Traveller, it's all pretty safe to say it just works. Anti-grav is not anti-mass, and older descriptions of the grav modules stated they require a gravity force to work against. One could argue that the field is sufficiently capable or providing a negative force in any direction to cancel out movement. Realistically you'd want to restrict the overall speed to one that could be quickly countered, so maybe grav forklifts don't zip around at anything more than say 10kph with a load, and maybe 20-30 w/o one. You could state that a safety governor kicks in whenever it's detecting a mass being moved.